This month's featured Common-Thread Give-Away Artist is Nancy Bariluk-Smith. She is the artist that creates beautiful jewelry with her own hand-made glass beads. 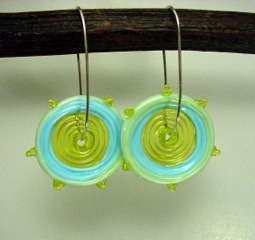 All you need to do to register to win these free ear rings is to visit her web-site, www.SpinningGlassStudio.com and leave a comment for her. I saw Nancy just this last month when all of the Common-Thread artists gathered for lunch at Jon and Maria Katz’s Bedlam Farm. I had almost forgotten how much I enjoy these artists. It was delightful to be with them, and I came away re-inspired. Nancy is an artist that has used many different mediums before finding her nitch with her hand-made glass beads and jewelry. She inspired me from the first time I met her. She is warm and open about her process as an artist and very encouraging to others. Her artwork is expressive of her life which is constantly open to new and exciting changes. At our luncheon, she talked about her preparation for her next future next life adventure and made me realize that each change in our life,whether elected, or forced, as in my husband's recent lay-off, is but a new opportunity to grow and evolve. She and her family were in the process of shedding the “baggage” of their life making them more free to experience the new. I heard Nancy’s words and thought of all that is weighing me down, and we laughed about how, I too am thinking of paring down, but had considered getting rid of my last adult child versus any part of my stash of sewing materials! I thank Nancy for revealing to me yet again, my own process, and freeing me to think creatively about letting go of some of the past that I continue to drag with me through life. I will likely keep my daughter, but will consider freeing myself, like Nancy has done to continue to create new and exciting work. Nancy is an inspiration both in her jewelry and her life. Don’t miss visiting her website and merely leave a comment to win her free give-away. Her beautiful ear rings are treasures made by a truly special artist and person and would be a wonderful gift to a friend or yourself. Don't miss leaving your comment on her web-site today. You could be the lucky winner!